The new Wii Bowling game looks cool. This week, inspired by Jorge’s optimism, I take a few minutes to recap some of the nice surprises from E3. As bloated and gross as it is, I still enjoy watching the E3 drama. There’s a circus-like appeal to the event. For the past few years, it’s been one of those “It’s horrible but I can’t look away” type of things. What tired franchise will be paraded around this year? How Microsoft try to convince me that the Kinect was a good idea? How many cringe-inducing sexist jokes will be in the press conferences? 2015 turned out to be a nice change of pace. The unexpected announcements were actually about games. There was a mixture of fan service and new material. While there were still plenty of faux-military shoot-fests, lots of genres got the spotlight and a variety of developers had some stage time to lend some personality to marketing-heavy presentations. Pelé talked about soccer. Martin Sahlin talked about yarn. Media Molecule talked about dreams. I hadn't realized how eager I was for variety, but all the quirkiness was much appreciated. On the more franchise-oriented side of things, even my icy heart was warmed by some of the fan service (it's still incredible to imagine The Last Guardian as an real, playable thing). Maybe this is more sad than anything, but the focus on actual games rather than motion control junk or transmedia noise was an immensely welcome surprise. After a rough start, it seems like this console cycle is finally hitting its stride. 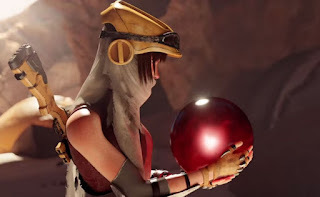 Am I the only one noticing that ReCore seems to be something of a spiritual relative of that old Valkyrie/Monolith game Septerra Core? The late 90s are back with a vengeance!